Believe it or not, Christmas is less than four weeks away. And Julie reminds me that Hanukkah starts on Sunday. 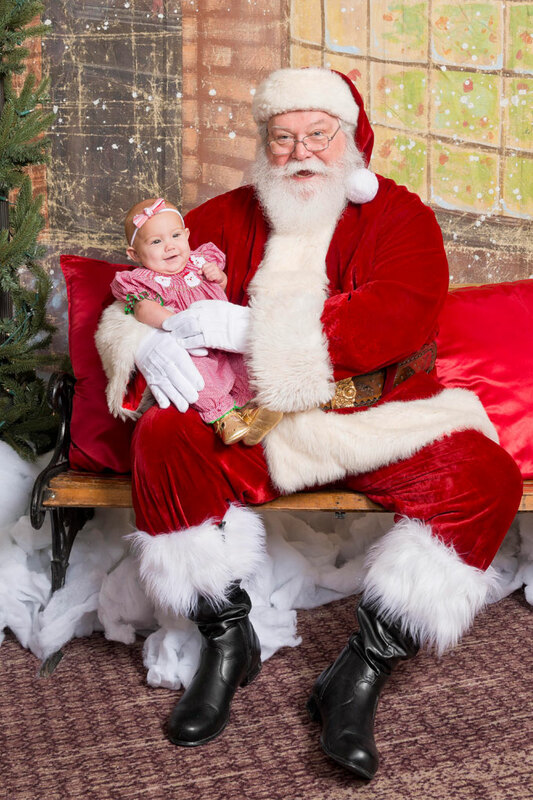 Last year at this time Elle was only six months old, so as much as I loved sharing in the joy of her first holiday season and her first Christmas, let’s be real – she didn’t really know what was going on. Sweet girl could barely sit up on her own. So our shared holiday experience was more so for myself last year. But this year, things have changed! Now, not only is she constantly on the move, she doesn’t stop talking, and she is oh so curious. She has the sweetest voice in the world and when she smiles and her face lights up, it warms my heart more than anything else I’ve ever experienced. . Truly, she is joy personified! So, celebrating this joyful time of year with her has me giddy like a — pardon the pun — kid on Christmas morning! While she might not understand everything, she can certainly understand a lot. And she can express joy and wonderment and awe and excitement and happiness oh so beautifully! I simply can’t wait to see Christmas through her eyes this year. With all that being said, so often the moments of joy can be lost in the holiday season amidst the hustle and bustle and pressures and all that. That’s why it is oh so important that we be intentional with how we spend the next four weeks. Surely there are endless events and parties and opportunities to fill our calendars with obligations. But are those obligations really obligations? Are they really what matters most? Do we have to do everything? Remember: it’s okay to say no! You don’t have to do everything. You don’t have to be everything to everyone. With all that in mind, I have decided to make a holiday bucket list. You might remember my summer bucket list, as well as the lessons I learned from making a bucket list. Indeed, I found my summer bucket list to serve as a useful guidepost for determining when to say yes and when to say no. Remember it’s not about checking everything off the list. It’s about having something to guide you and keep you on course. And when I say “on course”, I’m talking about keeping your actions in line with the true meaning of the season. The days might seem long, but the years are short. It’s important to make the most of it. 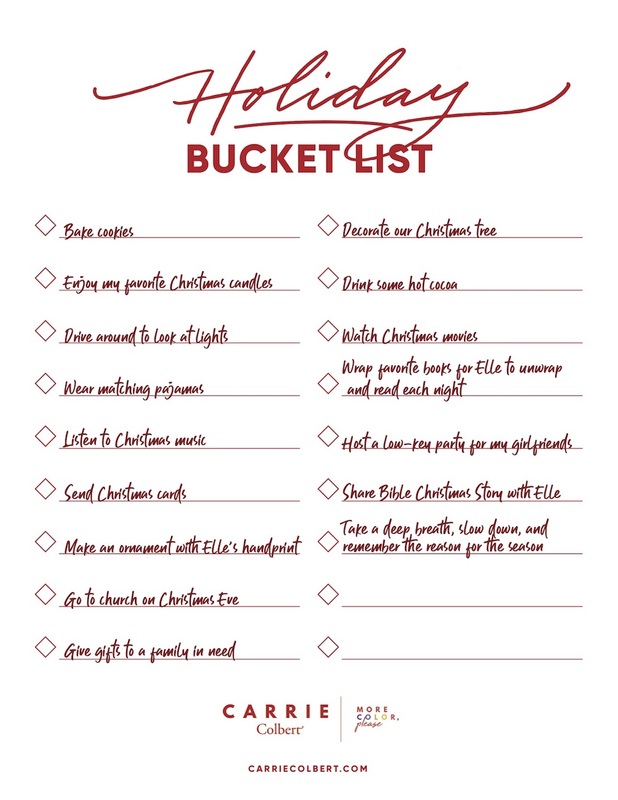 Below you’ll find my holiday bucket list along with a free printable for you to use to create yours. Enjoy and wishing you the happiest holiday season! If you use our bucket list form, be sure to share with us! Tag us. We’d love to see what’s on your list. All of us here at CarrieColbert.com wish you the most wonderful holiday season. Love this Buck List for the Holidays! I am going to borrow some of your ideas! Any suggestions for where to get matching pajamas? I have sent Holiday books for a cousin’s children to unwrap each night and they loved it. And each Christmas the children are given a new Christmas book with a matching pillow case. What great ideas, Kim! Thank you for sharing! Well, you set us up perfectly… We have a matching PJs feature coming up soon. In the meantime, Hanna Andersson is one of my favorite sources. Great bucket list. I love the inspiration that i get from it. Thanks! Thanks so much for saying that!